“Operation: Broken Feather.” By Dan Goor and Michael Schur. Perf. Andy Samberg, Stephanie Beatriz, Terry Crews, Melissa Fumero, Joe Lo Truglio, Chelsea Peretti, and Andre Braugher. Dir. Julie Anne Robinson. Brooklyn Nine-Nine. Season 1, episode 15. Fox. 2 February 2014. DVD. NBC Universal, 2014. “Halloween II.” By Prentice Penny. Perf. Andy Samberg, Stephanie Beatriz, Terry Crews, Melissa Fumero, Joe Lo Truglio, Chelsea Peretti, and Andre Braugher. Dir. Eric Appel. Brooklyn Nine-Nine. Season 2, episode 4. Fox. 19 October 2014. DVD. NBC Universal, 2014. Until Fox cancelled it, I had never heard of Brooklyn Nine-Nine. When the furor over its cancellation spread all over Twitter, I noticed (as did NBC, who picked up the show for a sixth season). My first question was "Does it have any Shakespeare?" 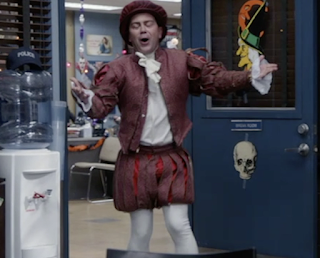 Since then, I've been investigating, and I've found a few instances of Shakespeare in the quirky sit-com about a police precinct in Brooklyn. Here are a couple of instances. First, in "Operation: Broken Feather," the character Jake Peralta makes fun of the character Amy Santiago, emphasizing the way the last three syllables of her name form the name of a particularly-evil well-known villain. Note: The language in the clip below is not entirely family-friendly. Second, in the episode entitled "Halloween II," the character Charles Boyle tries out a number of Halloween costumes on his colleagues. Note: The language in the clip below is not entirely family-friendly. I'll be keeping my eye our for more Shakespeare. But I think there will probably be a lot more in Season Six. The main reason Fox had for cancelling it in the first place was that there wasn't enough Shakespeare. Links: The Show at IMDB.